Installing the DVD drive is a cold-service operation. You must power off the server before installing the DVD drive. If you are replacing a DVD drive, remove the faulty or obsolete DVD drive first, then return to this procedure, Step 2. See Remove the DVD Drive. 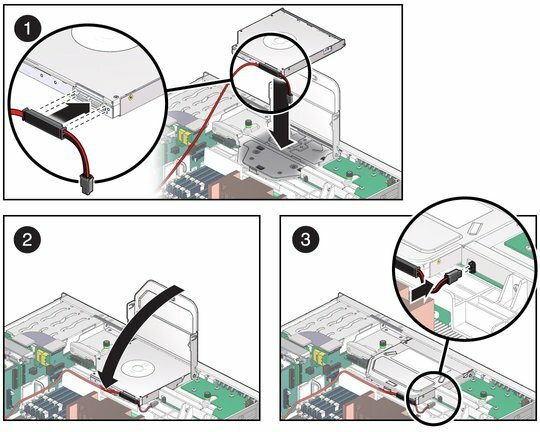 If you are installing the DVD drive as part of another component's removal or installation procedure, go to Step 2. If not done already, remove the two-wire cable from the DVD bracket and open the DVD cover. Attach the cable to the rear of the DVD drive (pane 1). Align the DVD drive to the location where it installs into the chassis. The slot of the DVD drive is toward the front of the chassis. The cable connector is to the left. Lower the front of the DVD drive into the DVD bracket (pane 1). While lowering the rear of the DVD drive, slide it forward into the DVD bracket (pane 1). Close the DVD cover (pane 2). Attach the two-wire cable to the DVD bracket (pane 3). If you installed the DVD drive as part of a replacement operation, go to Step 10. If you installed the DVD drive as part of another component's removal or installation procedure, return to that procedure. See Component Service Task Reference for assistance.